Just have a short time in the Floating City? Then this is the Venice tour for you, with skip the line access to top attractions, an intimate Venice city stroll and a gondola ride! Enjoy skip the line access tours of St. Mark’s Basilica and the Doge’s Palace; explore quieter neighborhoods and markets on our intimate walking tour; and experience that iconic Venice moment – a gondola ride on the Grand Canal and quiet side canals! 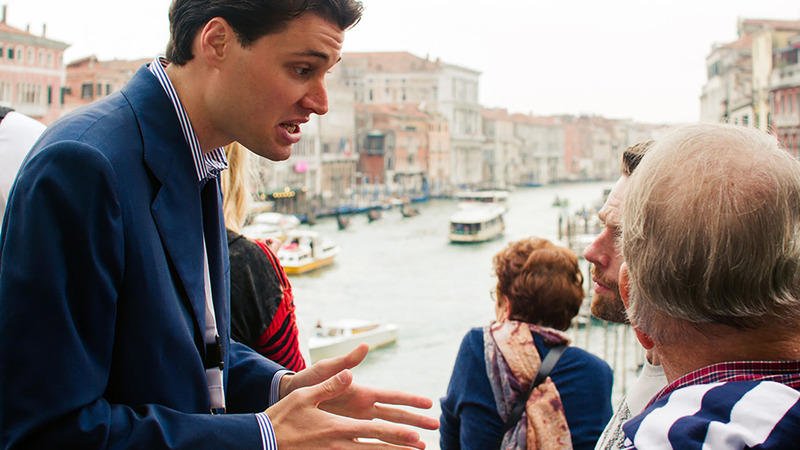 Throughout our Venice tours you’ll travel in groups of only 18 people or fewer, with expert local tour guides on hand to tell you the stories behind top attractions and hidden palaces. Meanwhile, pre-reserved skip the line tickets potentially save you hours of waiting in line. Your day starts as all great days in Venice do; with a stroll through the quiet back streets and bustling markets of the city. You’ll meet one of our expert local tour guides and max 18 other people for an intimate walking tour of the city. Starting early, we get to the Rialto Bridge before the crowds descend, to admire its incredible marble architecture before moving on to the bustling Rialto market. 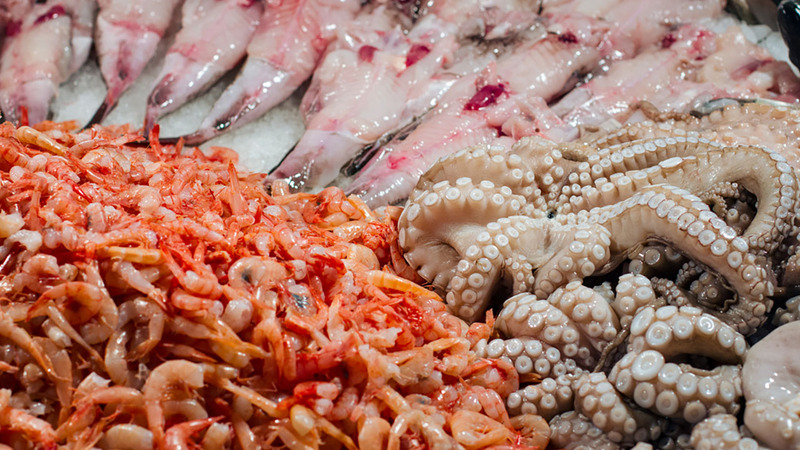 The chefs and Mamas of the city are shopping for dinner around this time, so what better time for a stroll through the stalls, with your guide explaining what each strange fish or vegetable is and how (and why) Venetian cuisine differs from the rest of Italy’s. 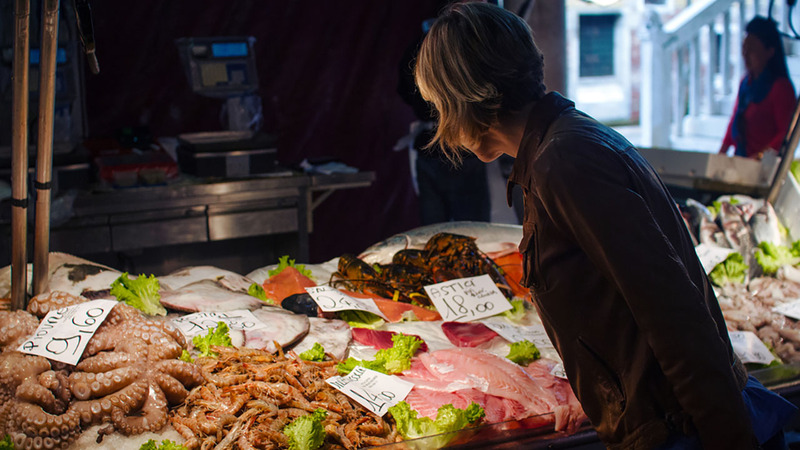 Throughout your Venice tour they’ll give you tips on what to eat and where while you’re in town. Our walking tour continues into the atmospheric neighborhoods of the city, across countless bridges and quiet piazzas. Along the way you’ll see the childhood home of Marco Polo, the Venetian merchant who first told of China; duck inside San Giovanni Gristosomo to see paintings by Venetian masters Bellini and Sebastiano del Piombo; and discover how the “Church of Miracles” got its name – plus so much more! 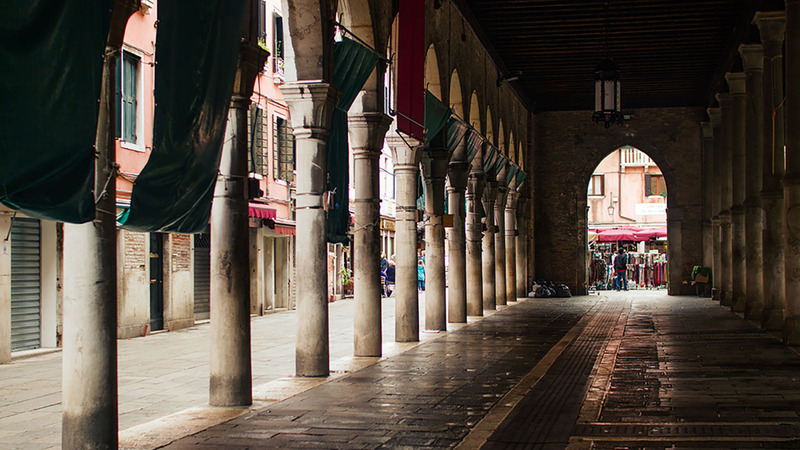 Our walking tour consciously veers away from the beaten track, taking you to our favorite local spots; so you get a taste of the real Venice, as well as the big name attractions. We couldn’t say we were covering the best of Venice in a day if we didn’t include a gondola ride. After your walking tour you’ll meet a local Venetian gondolier and your group will be split into different gondolas (max 6 people per gondola) for a ride along the Grand Canal and into the quieter back canals of the city. Duck under little bridges, admire ornate palaces and watch the world go by as you sit back and enjoy that quintessential Venetian moment. With independent Venice gondola rides costing around €80/hour, this half-hour ride, included in the price of your tour, is a bargain. We’ll give you a break for lunch after your gondola ride and meet back at St. Mark’s Square for the next part of our adventure. With pre-reserved tickets to St. Mark’s Basilica, we’ll save time wasted in long ticket lines. Inside, your guide will point out the features of this incredible church, explaining how its east-meets-west architecture came about; the shady means by which the relics of St. Mark came to rest here; and the details in the beautiful gold mosaics on the roof. Our day doesn’t end there though. With pre-reserved skip the line tickets to the Doge’s Palace, we’ll walk straight inside. It’s here that you’ll feel the most benefit for having a local tour guide. Home to some of the city’s most impressive artworks and architecture, Palazzo Ducale is so much more than something pretty to look at. Although it certainly is that, it’s also the historic heart of Venice; a repository for the best stories, from Casanova’s prison break to the Duke whose face was blacked out of every portrait and painting. 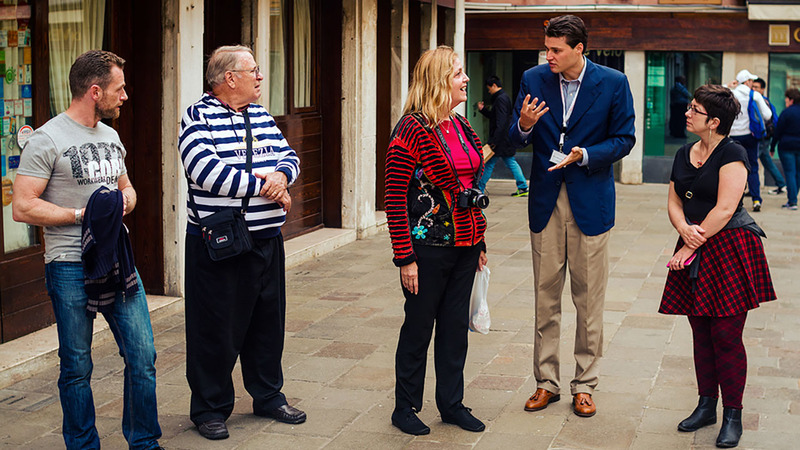 With our expert guides on hand to tell you the juicy details, plus small groups so you can ask all the questions you want, your Doge’s Palace tour is guaranteed to be an unexpected highlight of your Venice visit. As per all walks of Italy tours we have been on again this one exceeded our expectations. Tour guide was very informative. Nico was very knowledgeable, patient and professional. We were impressed with him and had a great time! Only problem we had was The Gondolier, who was continuously on his phone while trying to row with one hand , which resulted in gondola hitting against walls at times. Tour guide was absolutely excellent. Roberta was great. She was easy to understand and the headsets helped with noise. We got a nice tour of Venice as well as seeing St. Mark's and Doge's Palace. I would definitely recommend. Guiliano was great. A local's perspective was wonderful. The guide will not be with you on the gondola ride or during the lunch break. Please note that lunch is not included on this tour. Your guide will give you recommendations and tell you where to meet after lunch but please be aware that it is your responsibility to arrive at the meeting point in time for your afternoon tour. St. Mark's Basilica can be subject to unforeseen closures due to particular liturgical celebrations. In the case in which the basilica is closed, we will give you explanations from the outside. Please remember that the basilica is a holy place and attire must be appropriate: Both men and women are asked to wear clothing that covers at least the shoulders and knees. Walks of Italy cannot be held responsible for denied entry due to improper dress. Backpacks are prohibited inside of St. Mark's Basilica.